Show some WBNQ social media love to get free seats to this incredible show! 101-5 WBNQ welcomes the “” to the Bradley University campus. 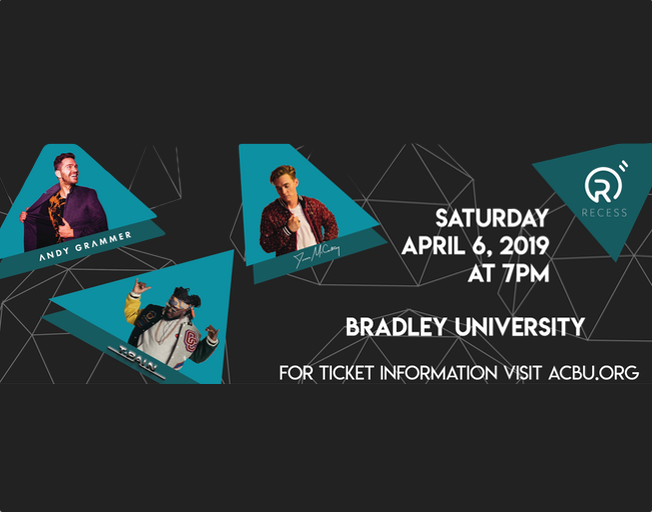 Andy Grammar, T-Pain, and Jesse McCartney will take over the Renaissance Coliseum on Saturday, April 6th. Andy Grammer is a multi-platinum selling pop artist who is all about inspiring and empowering the world by communicating his truths through his music. He is the first male pop star in a decade to reach the Top 10 at Adult Pop radio on his first two singles. Grammar has taken the music world by storm with 6 pop hits being certified gold or better. T-Pain has 60 hit songs under his belt and two grammy trophies on his mantle. T-Pain has cemented himself as one of the most influential artists of all time. After a successful run of #1 hits, albums, tours and a plethora of cameo appearances, he took some time off to enjoy the fruits of his labor, perfect his craft, and now returns to Peoria to perform for you. Listen to THE SUSAN SHOW each morning 3/25-3/29/19 to play “LAST COMMENT STANDING” on the WBNQ Facebook, Instagram, and Twitter pages. They will post a photo of Jesse McCartney, T-Pain, or Andy Grammer and ask you to comment below. 10 minutes and 15 seconds after it goes up, they will choose the last person who commented to win! Winners will not be judged on what they say in the comment section, but please be kind! Tickets are $38 and can be purchased online, at any Ticketmaster location, and at the box office the day of the event. For ticket information, click HERE.